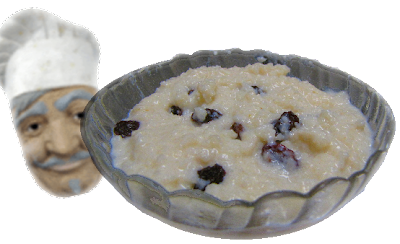 You see, in the good old days, rice pudding was made by popping the ingredients into an ovenproof dish and baking the pudding in a hot oven for an awfully long time. It tasted delicious, but ... see (1), (2) and (3) above. There is a quick and easy stovetop method that can be made even quicker and easier using ground rice. Don't have any ground rice in the kitchen? No problem! Here is how I made my own ground rice pudding. Here is a little bit of science for you. Small particles (e.g. of rice) have a higher surface area to volume ratio than large particles. I'll spare you the mathematical explanation, but it means that small particles absorb liquid more efficiently than large particles. So, if you use ground rice instead of whole grain rice, it will absorb milk more efficiently and make the preparation of your pudding faster and easier. And that means you get to eat it sooner. Boom badda bing. What's with the chef character that always appears in your recipe pictures John? The chef character in my images represents the professional cook in Vancouver who has told me he monitors my recipes. Apparently he likes some of the recipes; but others ... well, let's just not say any more. So true, I am keeping tabs on the recipes to make sure not too much culinary cheating goes on, haha. I actually also cook rice pudding stove-top but use arborio rice and treat it much the same as if I was making a risotto. Of course I would also add vanilla and maybe some spices, but now I'm just nit-picking.